This year my school district has embraced the book Making Thinking Visible and we are required to use three strategies per quarter. You can read about the book in more detail and check out other thinking strategies called Chalk Talks here and Headlines here. This thinking routine is fantastic for activating prior knowledge before and synthesizing it with new knowledge after a topic or unit has been covered. It encourages students to take their thoughts of the “big picture” and narrow them down to the heart of what is being studied. It also gives them a chance to think about “what this reminds me of” which will help them remember key concepts in the future. Put the following on the board, in students’ notebooks or whatever works best in your classroom. Like most of the other routines, students can work individually, with a partner or small group. When this is complete, the topic or concept is studied. Identify how your new responses connect to or shifted from your initial response. NOTE: It is very important for students to be encouraged to share their thinking during the activity. This will help all students see other perspectives and consider the content in a new way they might have not thought about. I have found a lot of success with using the 3-2-1 Bridge Routine during book talks in my middle school classroom. I will hold up a book cover and give students time to study it. I will then walk around the room so they can each inspect the book more closely. They then will complete their initial responses. This can be done verbally or in notebooks, or both! What three words quickly come to mind when looking at this title/book cover? What two questions come to mind when you look at this title/book cover? I think this book is going to be similar to ___________ because __________. 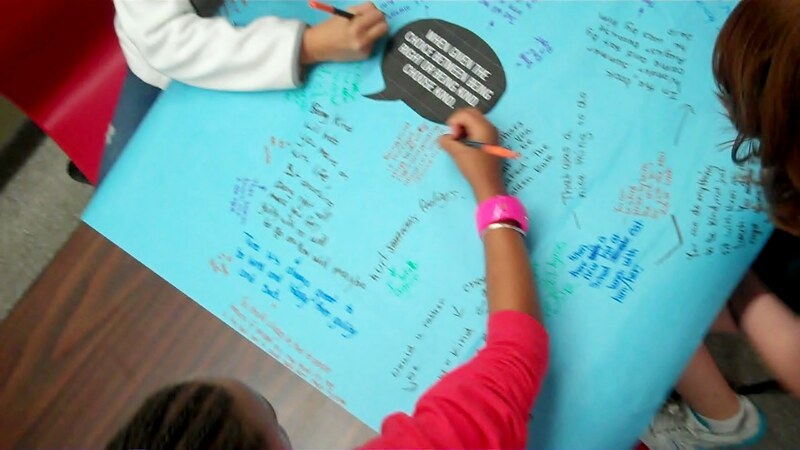 Students share their thoughts and what other books or movies/tv shows the cover reminds them of and when everyone has had a chance to share, I give my book talk. As I am talking, students are completing their “new responses” and it is very cool when they can’t help but shouting out “Yep! It IS exactly like _____” or “I was way off on that one. The cover is a little deceiving”. I have never had such fun, animated book talks as I have using this routine. There are lots of possibilities with this one and I’d love if you share some of your ideas on how to use headlines in the comments section below! Like the thinking routine Headlines I love using the after learning part of the 3-2-1 Bridge as a formative assessment tool. I can quickly see if my students get what we are doing and who needs some scaffolding to get there. I don’t think it’s a routine you should use before and after everything that is done in your classroom, but it is something to add to your teaching toolbox that can be used alongside or in place of a KWL chart. What Makes You Say That is a simple thinking routine that packs a LOT of punch and can have a dramatic affect on your students’ responses to content. Post coming soon! This year my school district has embraced the book Making Thinking Visible and we are required to use three strategies per quarter. You can read about the book in more detail and check out another thinking strategy called Chalk Talks here. I love the headlines thinking routine because it is easy for students and at the same time tells me a lot about their learning. Basically, students write a headline for a topic or issue that is simply a summary or main idea that they feel is important. It focuses on the big ideas of whatever your working on and allows students to have those building blocks in mind for future learning. Give students the directions to write a headline that captures the main idea of what they want to remember. Remind them that a headline is not written in a complete sentence, but is short in order to capture only the BIG idea of their learning. Students can work individually, with a partner or small group. It is very important for students to be encouraged to share their headlines as well as the story/reasoning behind them. This will help other students see other perspectives and see the content in a new way they might have not thought about. This is where the magic happens! First, document everyone’s thinking so that students feel valued and have the opportunity to check out the other headlines. Ask students if they notice anything that the headlines have in common or which ones helped them think about the content in a new way. You won’t be disappointed with the discussion students have about their thinking. It also might benefit your students to have these headlines handy to revisit during future learning opportunities. You can use headlines with just about anything. Try having students write a headline about their weekend, how class went for the day, an assembly, or even to sum up a conversation in class. There are lots of possibilities and I’d love if you share some of your ideas on how to use headlines in the comments section below! I love headlines as a formative assessment tool. I can quickly see if my students get what we are doing and who needs some scaffolding to get there. I used headlines when we were reading Seedfolks by Paul Fleischman and had students pick their favorite four chapters and write headlines for them because they aren’t titled already. It was very interesting to see them reflect on each chapter and decide what they were each mostly about. My eighth graders did a pretty decent job with this activity and enjoyed it because it was something different. When we looked at everyone’s headlines we had a great discussion about the big idea of each chapter and students loved sharing their ideas. The 3-2-1 Bridge is a thinking routine that works well when introducing a new topic. I love using it for book talks! Post coming soon! I am always a bit skeptical when something new gets put on my plate and was very leery to even look at this book when it was introduced to our staff last year. How am I going to fit this in with all the other new stuff we are supposed to do? I kept asking myself. I did eventually look at the book, and surprisingly got really into the idea of thinking routines. Last year I tried out a few just to see what would happen, and this year I have started planning which ones will fit best with certain activities I already do. I thought it made perfect sense to share these routines as I use them in my classroom and hope they will give you ideas as to how you can use them in yours as well. What do you mean by “Making Thinking Visible”? 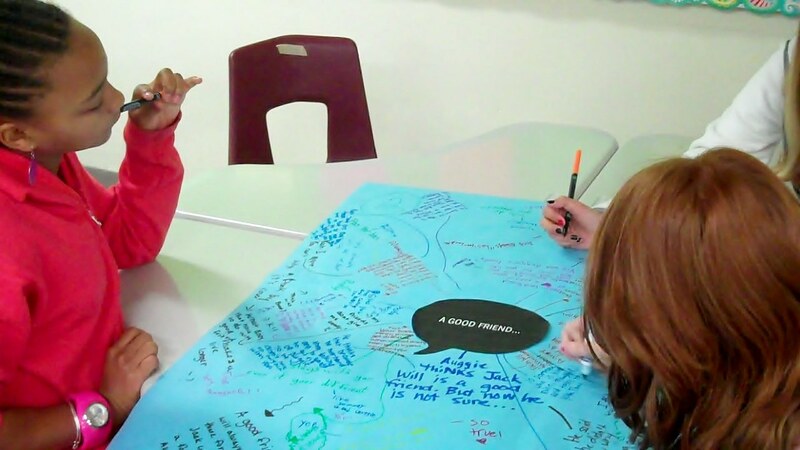 The first thinking routine I have used this year is a Chalk Talk, in which students are asked to think about ideas presented to them, make connections to others’ responses and then question the ideas and responses of their peers. 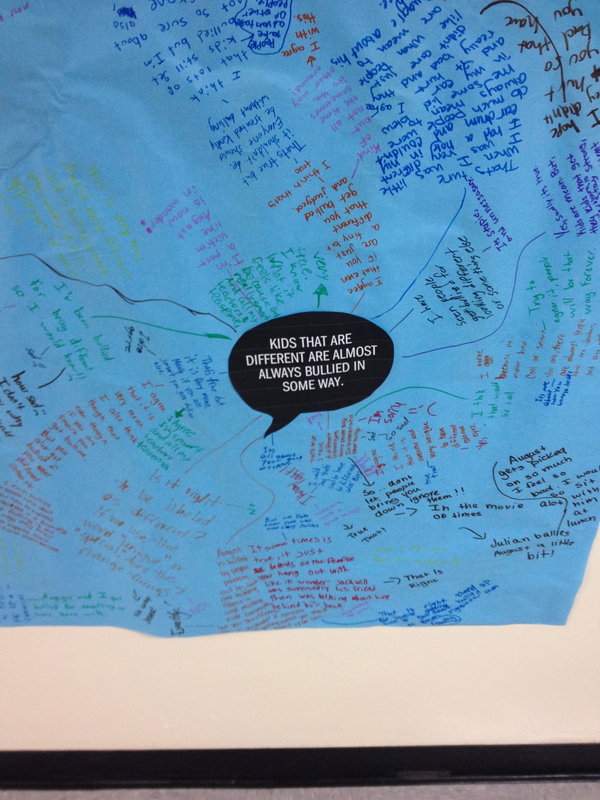 It is very easy to implement and is an excellent way to stimulate some great “silent discussion” in your classroom! 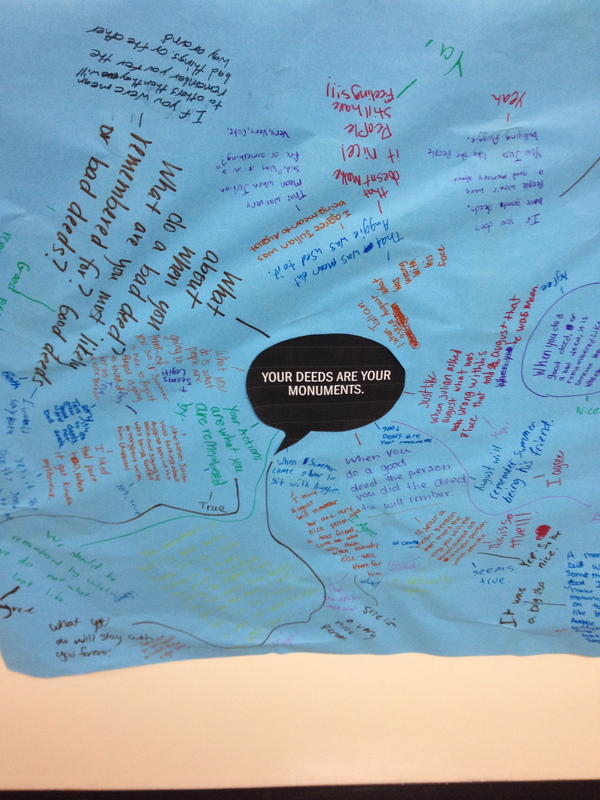 Place the chart around the room, giving students lots of space to think and write. Go over the prompts with students in advance and remind them that there is no talking during this activity. Set the timer for 5 minutes and direct students to their first prompt. Circulate as students begin reading their first prompt. Remind them that they are to respond to the prompt and then think about and respond to other students thoughts by making connections and writing their own responses. Students should rotate as needed through the prompts. Note: Students need about 3 minutes at the first prompt because there are no comments yet, but will also need time to go back to this prompt at the end of the activity to read what others wrote. At this point, the class should come together and talk about the learning that took place. 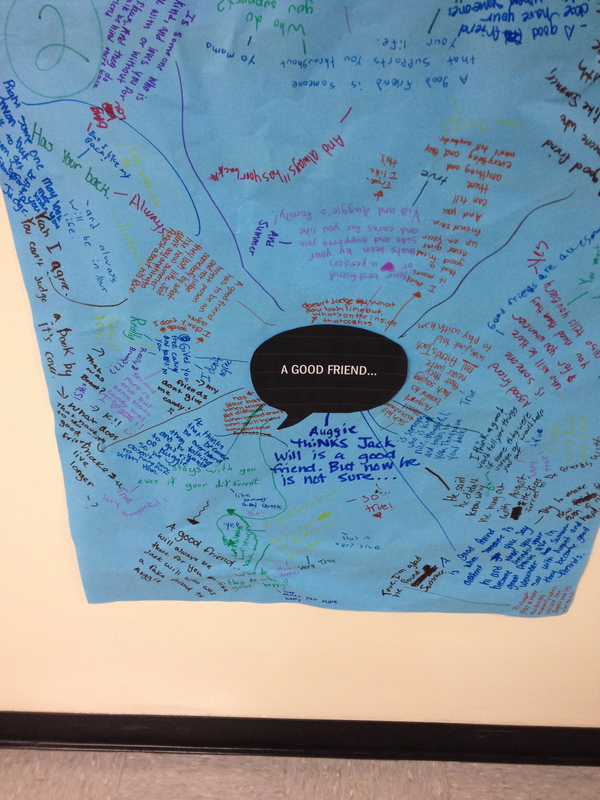 How did the students’ thinking change after reading others’ responses? What patterns did they notice? What surprised them? This activity can be adapted for a variety of uses, such as a unit review or brainstorming for a group project. 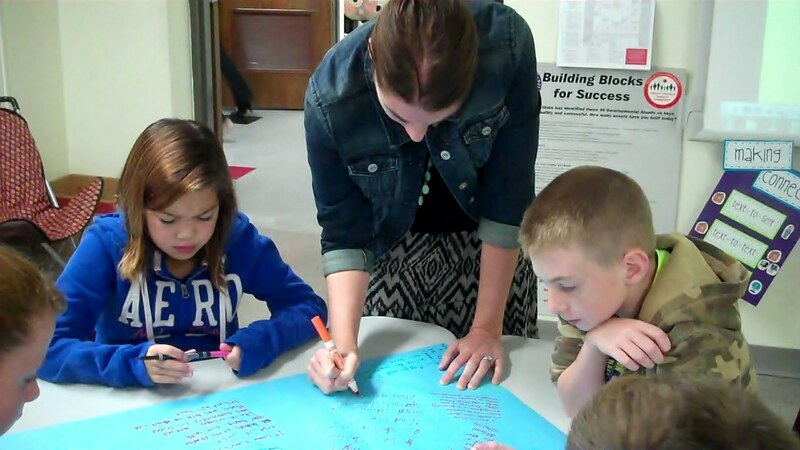 It is pretty versatile, and just the idea of using a marker on giant chart paper and moving around the classroom instead of sitting in a desk for a period is enticing to students! Our first Chalk Talk went really well. This sixth grade ELA class worked well moving from prompt to prompt and their feedback exit slips indicated that they enjoyed the activity. When asked what could make the activity better next time, they suggested that they have even more thought provoking prompts, more time at each prompt, the ability to have other classes comment on the prompts and to be able to revisit the same prompts at a later time. If I had to do anything differently next time, I would 1. make the chart paper bigger and 2. make sure that the prompts really lend themselves to differing opinions to provide for thought provoking discussion. Headlines are a fantastic way for students to summarize and capture what a piece of text, speech or video is about. We are writing headlines for Seedfolks, which we just finished this week. Blog post coming soon!